Martial Arts is the traditional foundation on which Wah Ngai is established. 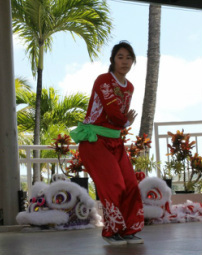 By teaching the traditional Chinese martial art of Kung Fu, our students learn the strength and discipline that is embodied in the lion dance that they perform. Wah Ngai members are encouraged to maintain a physical lifestyle. Many of our members partake in other forms of self-defense training and youth sports activities. We believe a variety of physical activities will develop the mind and spirit to be more versatile and well-balanced.